Coral Gables, Florida is a medium-sized city with a population of 50,533 people. Coral Gables has a population density of 3,908 people per square mile. This would be considered well above the national population density level. If we take a look at the last Census, the vast majority of the population falls within one racial group (91% White). Given that fact, Coral Gables could be considered less diverse than other cities. Additionally, more than a quarter of the population of Coral Gables are of Hispanic or Latino origin, and 52% of the population also speak Spanish. 85% of the people in Coral Gables (over the age of 15) are married and 63% have kids under the age of eighteen. Knowing that, it’s safe to say that this area could be a great place for other families to lay down roots. Without the right tools, moving to any new city can be very stressful and challenging. Living in Coral Gables, Florida could be a great experience for anyone who puts in the effort to do the research required. With useful information like crime, weather, employment, housing and other key data points, finding the best places to live in Coral Gables and in the areas around Coral Gables is a much easier task. Coral Gables has a livability score of 81/100 and is ranked #148 in Florida and #1,454 in the USA. Based on this score, Coral Gables would be considered a very livable city! Coral Gables has also earned the rare honor of ranking in the top 10 percentile among all cities. 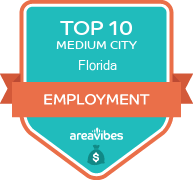 Based on the scores for each individual category, Coral Gables has received high marks for amenities (A+), crime (B-), weather (A), education (A+) and employment (A-). Regrettably for Coral Gables, there are some categories for which it does not score well, this includes: cost of living (F). Location, location, location - possibly the three most important words in your search for a new place to live. Fortunately, in Coral Gables, there is no shortage of amazing local amenities and interesting things to do. Some of the notable things to do include: Fairchild Tropical Botanic Garden, Venetian Pool, and Miracle Mile. Crime rates can be the deciding factor for anyone looking to relocate to a new area. Coral Gables gets top scores for their low violent crime rates of 146 crimes per 100,000 residents, which are significantly lower than the national average. Knowing that the Coral Gables schools rank highly for test scores plays an important factor in deciding if this area is the right place to live. The average school test scores are 73%, which is far higher than the national average. Being close to public transportation, grocery stores, parks and other conveniences are all important when weighing your options for a new home in Coral Gables. Before you determine if any of these amenities are available in the area, you will also want to know if the real estate prices in Coral Gables are affordable. The median home price for Coral Gables homes is $696,000, which is 317.3% higher than the Florida average. If we take a closer look at the affordability of homes in Coral Gables, we’ll see that the home price to income ratio is 7.6, which is 123.5% higher than the Florida average. For most people, purchasing a new home is the biggest investment they will make in their lifetime. Taking a look at overall real estate appreciation rates in Coral Gables will offer some insight into determining if your home purchase will be a solid investment for years to come. In Coral Gables, the year-over-year appreciation rates were 1%, and the 5 year appreciation rates came in at 7.8%. How Do You Rate The Livability In Coral Gables? I have lived near Coral Gables, Florida for several years in the past and have to say that the area is quite conflicting when you consider whether it is a nice place to live or not. On the outside, the area of Coral Gables is spectacularly beautiful, as the city sits just south of Miami and occupies the beaches and neighborhoods in that region. Although the pristine beaches and palm trees make the area sparkle, the reality is that there is a tremendous amount of crime and the area is quite dangerous. Over the last several years, the crime rate has risen dramatically in the area, specifically in the number of robberies and home invasions. A major problem in the area is the fact that police agencies have been telling people that the crime rate has been dropping, yet the statistical evidence is quite the contrary. It seems as if the police in the area know that the crime rate is literally exploding and don't want to see people flee the area. There is no doubt that there is a ton of things to do in Coral Gables, however. Coral Gables occupies a lengthy stretch of some absolutely stunning beaches, which can be explored through ocean activities such as snorkeling, swimming, surfing and fishing. The nightlife in this area is without a doubt some of the best in the country, as well as the restaurants. There is a reason that people enjoy vacationing in south beach so much and Coral Gables is really an extension of the city, although it is more like the suburbs. If you can stomach the rising crime rate that has been inflicting this area, it very well may be a great place to live. Source: The Coral Gables, FL data and statistics displayed above are derived from the 2016 United States Census Bureau American Community Survey (ACS).